The GBK line of hooks basically takes the idea of a hook with a self-closing latch and improves upon it. The tips on these hooks feature a Grip Latch, meaning the latch fits in a groove on the body of the hook. 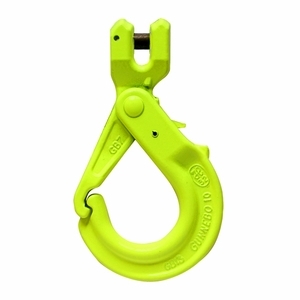 This ensures a good, solid connection and helps the user in the field identify when a hook is starting to deform. For those unfamiliar with the benefits of self-closing chain hooks like these, note the following. The latch is made from heavy-duty alloy steel and lasts longer than standard safety latches. It automatically closes once a load is applied and cannot open under load. Once the load is released the hook opens easily using the trigger on the back of the hook body. These hooks also have larger throat openings than standard sling hooks. They are proof-tested and certified with a 4:1 safety factor.